Dunkin’ franchise owner Gianna D’Angelo really understands her business. She began working the counter of a Dunkin’ franchise in Somerville, Massachusetts, at the age of 14, and for the last twenty-seven years she has been a co-owner of three franchises with her father, Pat D’Angelo. 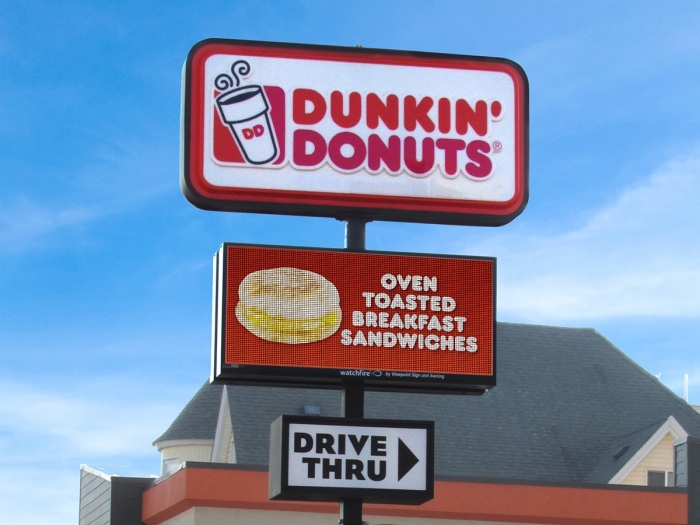 She knows what works, and in 2014 she experienced a powerful new tool in her advertising arsenal – a 19mm Watchfire LED sign. Her Everett, Massachusetts, franchise locations are all on busy thoroughfares. This already gave her good returns but early in 2014, she added a Watchfire LED sign to her busiest location on Broadway and saw business explode. “One morning we advertised our 99 cent oatmeal on the LED sign. The next morning, the manager called to say that we had completely sold out of oatmeal.” She began to notice that any item promoted on the sign sold fast and sold out. D’Angelo has discovered that with the control she has with the LED display, she can quickly promote seasonal items heavily during the window for those items. As a result, she has no wasted inventory from seasonal merchandise after the sales window has closed, reducing waste and improving her bottom line.